What an incredible evening I had at Feinstein's/54 Below seeing Broadway couple Andy Karl & Orfeh performing their final night of their new show Legally Bound. It was an evening full of powerful voices, fun stories, & great songs! Andy & Orfeh's duet of One Direction's "History" was terrific as well as Prince's "Kiss!" Their voices blend so well togehter, really complimenting each other's strengths. Andy's cover of "What Are You Doing New Year's Eve," truly got me into the holiday spirit, while Orfeh's version of "Baby Please Come Home" was just one of many songs that brought the house down! Her rendition of Whitney Houston's "I'm Your Baby Tonight" and Janis Joplin's "Piece of My Heart" raised the roof twice over! A real treat was getting to hear Andy sing "Keep on Standing" from Broadway's Rocky & "Seeing You" from the Broadway-bound new muscial Groundhog Day! Andy Karl and Orfeh at Feinstein's/54 Below, Photo Credit: Keith PriceIn addition to Orfeh & Andy, we were treated to their special guests Jeremy Kushnier (Broadway's Jesus Christ Superstar) & Katie Rose Clarke (from Broadway's Wicked). Katie wowed the crowd to "Margartia Christmas," a really fun, original song she co-wrote with Steven Jamail. What a great voice she has! Jeremy delighted the audience with a rockin' hit from Neil Diamond's Christmas album. Always great to hear Jeremy sing! 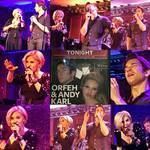 I could go on & on with what I devoured over each song, but instead I'll leave you with this...I hope Orfeh & Andy continue to perform together! It's an evening I'll always remember! !